Well, I so appreciated your comments and questions that yesterday I descended to my Creation Station to do a little more Gelli printing, to give you a few more examples, and explain the process a bit. All the following are the results from yesterday's printing session. They are not wonderful, but at least they made the cut from either the wastebasket or the pile of prints to continue printing on. A gelatin plate for monoprinting can be made in the kitchen. Yes, the kitchen! The ingredients are simple: glycerin, unflavored Knox Gelatine and hot water. Watch this quick video on how to make your very own gelatin printing plate. I found an interesting article that compares a homemade gelatin plate, as in the video, to a manufactured gelli plate, which is what I use and will be talking about. There are now several companies that make Gelatin Printing Plates. But, the first one that I heard about and was drawn to a few years ago was the GelliArts plate. Here is a link to the GelliArts website, where you can find a plethora of exciting ideas, projects, videos and other products. Before I allowed myself to become submerged in the actual printmaking, I watched many videos and read books on the subject cover to cover. My first Gelli Plate was huge, way too huge for me to make any sense out of. Bought used from a friend, it measured 12" x 14", and retails for $72.99. After my first foray into Gelli Printing with this giant, I was ready to call it a lost cause. Awhile later, I was at Hobby Lobby and discovered a student grade 5" x 5" plate. Using my 40% off coupon, it was affordable, and I was on my way to attempt Gelli printing once again, this time with a plate size that I thought I could handle. The 5" x 5" size turned out to be just the ticket to keep me interested -- and printing my head off. Since then, I've also invested in 3" x 5" and 5" x 7" plates. Among those three sizes, I really don't have a favorite. For yesterday's printing session, I was using the 5" x 7" plate. After about two years of Gelli printing, I feel like I'm still learning and experimenting. So I don't consider myself qualified to give too much advice on the rights and wrongs of Gelli printing. After watching several artists' videos and reading my books, I have kind of developed my own system and style. If you want to watch a very accomplished Gelli printer in action, I suggest you check out Birgit Koopsen's YouTube channel. She lives in The Netherlands, and, in my eyes, is the best of the best at this type of printing. You will learn a lot from her! The basic tools you need for my style of Gelli Printing are: a Gelli Plate, a brayer, (you are supposed to use the flat of your hand, but mine is so arthritic that it doesn't go flat, so I use a bone folder), a plexiglass mat, acrylic paints -- I use both tube and bottle acrylics -- stencils, baby wipes, and any type of paper. In fact, yesterday, before I started my printing session, I was about to recycle last year's telephone book, but then looked at it, and questioned the wisdom of getting rid of it. So, I tore the cover off and I'm now using the pages for printmaking. I'm not sure yet how I like it, compared to a more traditional weight of paper. Some people like using deli paper for their prints. I, however, find it to be much too flimsy and unsatisfying. Each time you pull a print (make a print), the result will be a monoprint. You will never be able to reproduce the same print. If there is ink remaining on the plate after you pull a print, you can pull another "ghost" print. Sometimes these ghost prints are even more appealing than the original print. My basic process is: Drop a small amount of acrylic paint on the Gelli plate (a little goes a long way), brayer it out until it is well distributed and even. Unless, of course, like me, sometimes I leave the paint a bit streaky with some of the previous prints' paint showing through. I then lay a stencil over the paint. At this point, you are supposed to use your hand, but this is where I smooth over the stencil with my bone folder. Gently pull the print away from the plate and set aside to dry. After removing the stencil, you can pull a ghost print directly from the paint left on the plate. To me, a finished print consists of layer upon layer of paint and design. Sometimes, I would be willing to bet there are as many as 15 layers of paint. If it becomes too muddy or discombobulated, it ends up in the trash. But, even these "failures" can be used in papercrafting with punches or dies. Very little paper actually gets thrown away. I keep my favorite prints in sketchbooks with black paper. I love looking through these on occasion to watch the evolution of my Gelli Printmaking journey. Oh. And I never clean anything off. It's always so cool to be able to pick up from either the brayer or the plate remnants of previous prints. If your brayer is so thick with layers of paint and doesn't roll anymore, soak it in a container filled with Murphy's Oil Soap overnight. It softens the paint so it can be peeled off. Not an easy task, so I just let it go as long as I can. In fact, the photo below shows how I left my space after today's printing session. All the papers you see are pieces that will be used for subsequent printing forays. If you have any further questions, please ask me. I will try my best to have an answer for you. I hope I have made the process at least a little bit clear for those who have never heard of Gelli printing. Gelli Plate printing: definitely my happy place. 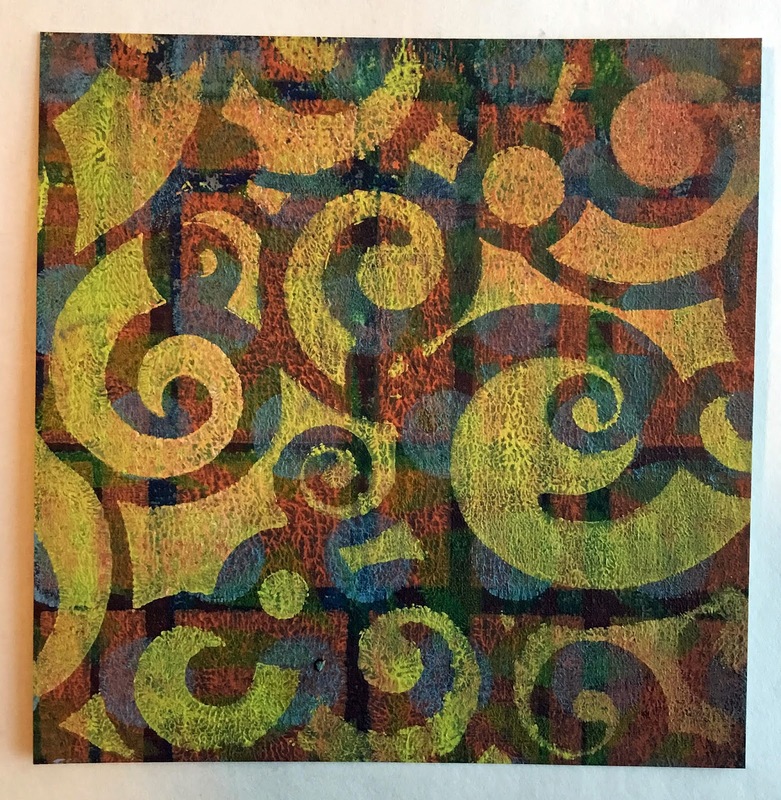 Isn't gelli printing the most fun? I haven't done it in quite awhile and now that I see yours I feel inclined to dig out my press, deli papers and paints and go at it again! You have made some beautiful prints! It's really an interesting technique! Thanks for sharing with SYC. I have never seen this before, but it is so beautiful! I am in Hobby Lobby all the time (with my 40% of coupon in tow), so I will try it! Thanks for visiting #ThoughtFullThursday! Such a neat sounding technique and one I have never heard of! Can't wait to give it a try. I feel very ignorant as I'd never heard of Gelli printing, but I love your results. What fun! I love how you've used your old yellow pages too - brilliant. I hadn't heard of this technique, either; pretty cool! Thanks for sharing at Party in Your PJs! Great post, another new technique to learn!